Here's a simple way to do good things for the environment while saving ink, paper, and printer costs. 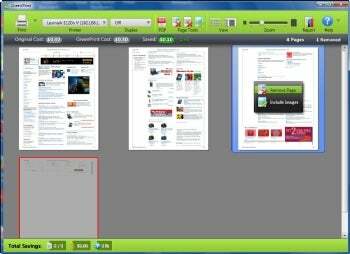 GreenPrint Home Premium lets you preview print jobs, and then remove unnecessary pages (such as those with no text on them) and images before printing. In that way, you'll get by with printing far fewer pages. To save even more ink and paper--to say nothing of money--you can use GreenPrint Home Premium to create PDFs from the pages instead of printing them. The $29 program (30-day free trial) is available in a 32-bit and a 64-bit version. Green Print Home Premium helps you save money--and the environment--by printing only the pages you deem necessary.